I finished my Scrap Vomit quilt!!! I love it so much, even though it's all made of scraps. But I think that makes it more special. So many memories everywhere you look. 1,225 squares of memories. Oh yeah, you heard me. 1,225. Sounds daunting, and I'm kind of glad I didn't do the math beforehand haha!! I took a couple of days to think about how I wanted to quilt this. My initial thought was straight line, but I didn't want to fuss with the solids in Block B. So I did free motion flowers ala Elizabeth. I didn't do anything in between them because I liked them just on their own, plus it'd keep the quilt nice and soft. 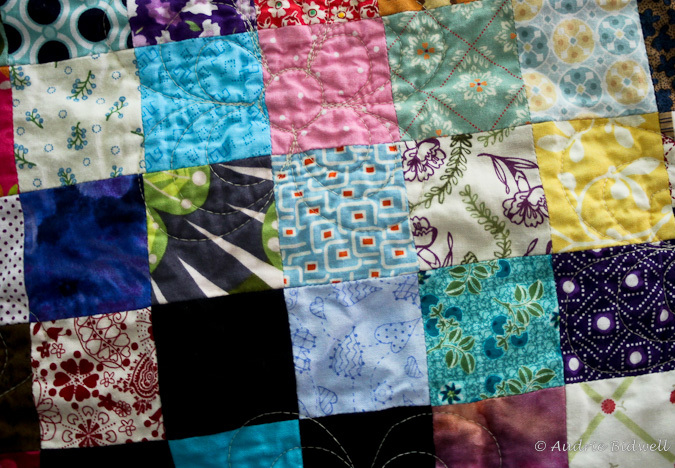 I used a 50wt Aurifil thread because this quilt was so heavy with all the many, many seams, and I thought the lighter weight thread could only help. And thankfully, my machine likes it! One of my favourite squares is this blue, white and orange one. I got it from a scrap bag I got at one of Denyse's sample sales. 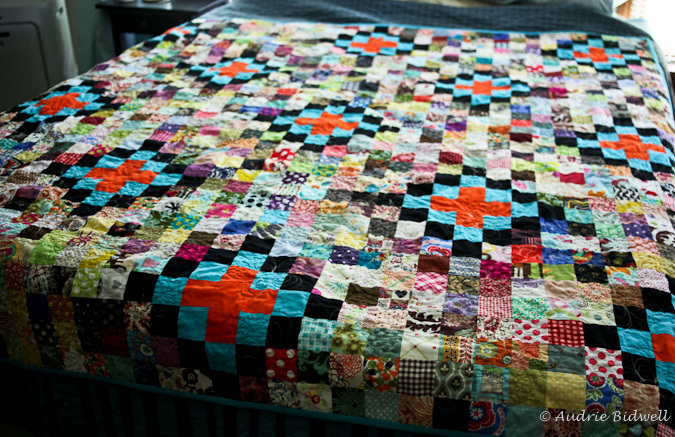 Don't know what it is, and I'm fairly certain it's not quilting cotton, but I love it. For the backing, I used a fabric I got from Denyse's sample sale too. Almost 8 yards for $10. It wasn't my colour but it oddly appealed to me. And is slightly vomity, so it suited this quilt, I thought hehe Somewhere in the quilt are little squares in the green colourway of this fabric. Much less vomity too. The scrappiness makes it looks so warm! Great finish. Tremendous! 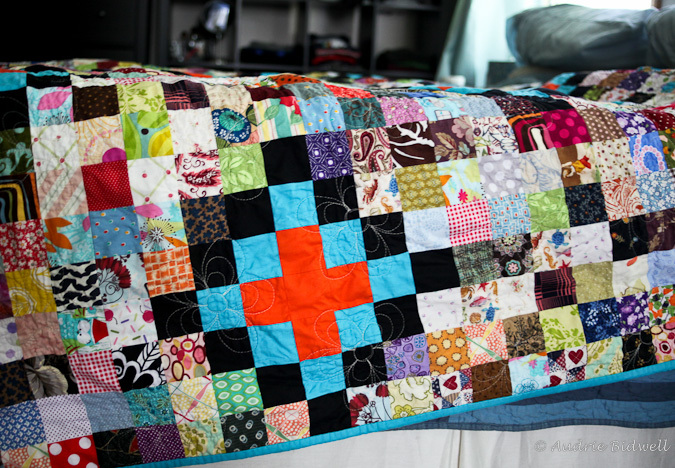 I love a scrappy quilt and this is just great. Wow! I love it! Now to collect some vomity scraps so I can do one too! Love the flower quilting - awesome! I love it - great finish! Great name for a Postage Stamp Quilt! 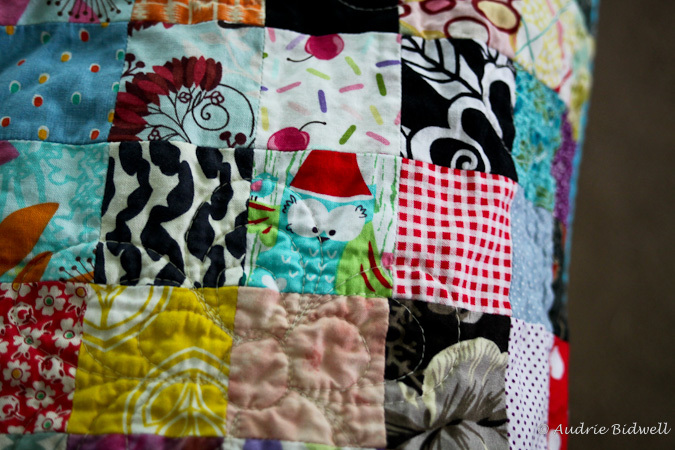 Love your quilt!! I bow my head to you! Brilliant and lots of fun.... I love all the color and I think it would take someone lots of hours to find all the fun little treasures and surprises in the quilt top. Didn't think all that random fabric would come together but it looks fab!!! lovely! I'm doing a scrap quilt with pieces of all my favorite fabrics. I love the "scrap vomit" name. Might steal it. But I'm not going to be finished until 2014 at the earliest. 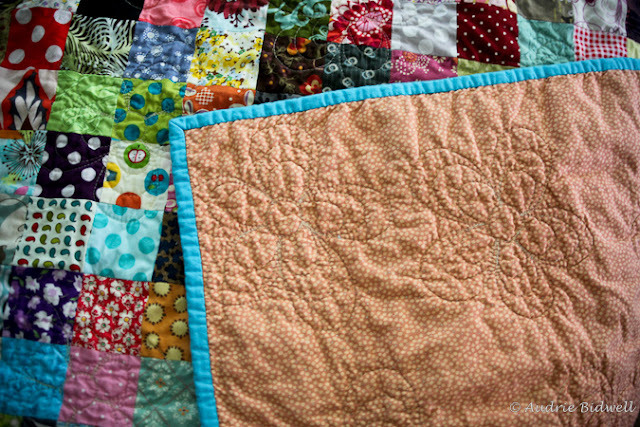 I'm not a full-time quilter. I have way too many hobbies. fantastic!!! love the quilting, too! I can no longer rest comfortably till I make my own scrap vomit quilt! Yours came out FAB...I love it. Just found your blog via Katie (Ginger Monkey) and saw your post about your awesome Scrap Vomit. PS: Aww, sorry, spelled your name wrong! Just gorgeous, I love it. And I have some of that blue w/orange that you got from DS scrap bag. It was a quiltling cotton, I bought mine from Purl in soho. It's suprisingly enough a reproduction print, looks really modern! It also came in a lovely lavendar colorway with sort of piney green accent. Anyways, just discovered your blog and am loving it! You have a unique color eye, it's fabulous.